E-Z UPÂ® Hub Tent features 1-piece pop-up high-strength steel and aircraft aluminum frame as well as clear span rigid peak design for maximum headroom. Suited for use at trade shows, sports events, and festivals, tent is offered in 13 x 13 and 16 x 16 ft sizes and in 22 fabric colors. Quick connect ceiling fan/lighting fixture is available. 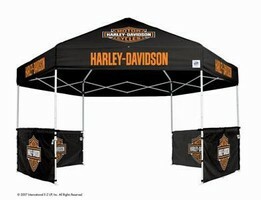 Torrington, CT - Just out this year, the E-Z UP® Hub Tent available from MVP Visuals. With 50% more graphic space than the traditional 4 sided tent. The patented one piece pop up frame makes this tent easy to set up and take down. The unique shape allows your graphics to be seen from six sides. With your screen printed graphics this tent is sure to make you the center of attention at trade shows, sports events, festivals, etc. Available in 22 fabric colors.